I love looking back and remembering how that felt–hearing him speak and give me direction for the first time. All my life I had gone without knowing who he was or what a prophet was even needed for. And then, just like that, I suddenly knew I would always need him. Over the five years I’ve been a member the excitement and fire has died down a little as I prepare for General Conference–yes, I still love that time of year when I can hear guidance from the pulpit–but of course, with time, I have gotten used to being under the direction of a living prophet. It’s just become a natural part of my life. 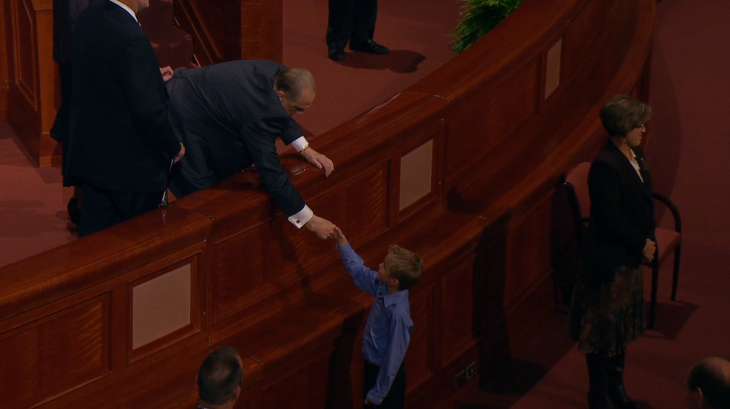 A young boy ran up to the front of the conference center, and the prophet leaned down to take him by the hand. And suddenly, I remembered it all. The excitement, the awestruck wonder–the amazing gratitude that filled my heart as I quickly jotted down notes. I remembered how blessed we really are to have a living prophet in this day and age–a man who is just as much a prophet as Adam, or Moses or Abinadi or all the others who went about God’s work and spoke truth. And just as much as this sweet little boy needs him who ran up to grab his hand, I need him. You need him. We all need him simply because in this broken world where we are overwhelmed with the noise and booming voices of those pointing us toward different paths, we need the voice of the Master–the voice we recognize as the tour guide down the right path. I saved that picture of the boy as soon as I found it drifting around my newsfeed on social media, saving it as a reminder to myself that we will always need a prophet’s voice, and reminding myself to be more like that child. To trust and follow the spirit and elbow my way through crowds and doubt and opposition just to get to where I know truth and light is. Conference finally ended *It always seems to go by way too fast* and I found myself enjoying different blog posts and updates from members of the church who took away something from conference that aids them in their lives. And then, I stumbled across this. Now, I’m not trying to accuse the author or the New York Times of anything and a lot of what the author said in the article is true and well-written. I’m just going to relay how I became slightly saddened at how this article has circulated around the walls of friends and family and complete strangers who (in many cases that I’ve read) are suddenly questioning the authority and validity of our prophets and are suddenly crying out for reform. This article, along with some other things I’ve read, says it was told that the “church” makes mistakes. When in reality, President Uchtdorf and other apostles in the past have said that “people” make mistakes but the church and it’s doctrine is always true. But never ever was it mentioned that revelation, guidance, or inspiration is just told to us off the cuff and eventually may go down as error. His talk wasn’t a PR move to cover dirty tracks. On the contrary, it was said that although everyone is human, prayer, supplication of the Lord, and inspiration from the Lord goes into the preparation of the words given to the church. Many of the quotes this weekend have been taken out of context. “The prophet will never lead us astray” is something we hear a lot and it’s often misconstrued as meaning the prophet is a perfect divine being who can do no wrong. But that isn’t correct, as we’re all well aware. The reason the prophet won’t lead us astray isn’t because he’s infallible– it’s because the Lord won’t let him. This twist of some General Conference words this weekend have not only sparked articles, but has somehow given ammunition to movements within our own church, such as the Reform Mormonism movement. As I’ve delved into reading about these different organizations and writings it saddens me that suddenly the consensus is either that we don’t need a prophet OR that the prophet is just a really great teacher, but changing the church and seeking “pure truth” is a personal battle and one we don’t need a prophet for. It’s saddening. And it’s been a personal battle for me to see active, great members decide that the world’s loud, politically correct, “love means not having rules” voice is more worthwhile to listen to. Because it isn’t. And it never will be, even though I realize that saying that isn’t going to be popular. We live in a time where good is called evil and evil is called good. We live in a time where it’s confusing how to vote or what stance to take when so many of us want to be kind and good and loving but certain mandates of the Lord are called intolerant or mean. We live in a time where it’s not popular to read books written thousands of years ago or to spend a whole weekend watching hours worth of talks by men and women whom most of us have never personally met. We live in a time where faith is synonymous with ignorance and declaring something as a sin before God is somehow declaring that we aren’t being Christlike. It’s a scary time. And because of this, I thank God for a prophet. I thank God for little children who nudge their way down an aisle of a conference center to touch the hand of the person they know with all their heart counsels with the Savior. I’m so grateful we have personal revelation as well as revelation from God’s mouthpiece, just as it was thousands of years ago. It’s evidence of God’s unending love. The world is changing and ideas are reforming and of course it’s okay to seek answers and go on that personal journey toward truth. I also realize that we sometimes are given revelation from the mouths of prophets that revolutionize how we’ve been doing things for a long time–such as missionary age. But we wouldn’t have been given that inspiration that has amped up mission efforts without the voice of a prophet, for example. I’m personally glad that the majority has clear minds and hearts that wish to do good and seek truth and have personal inspiration in their daily lives. 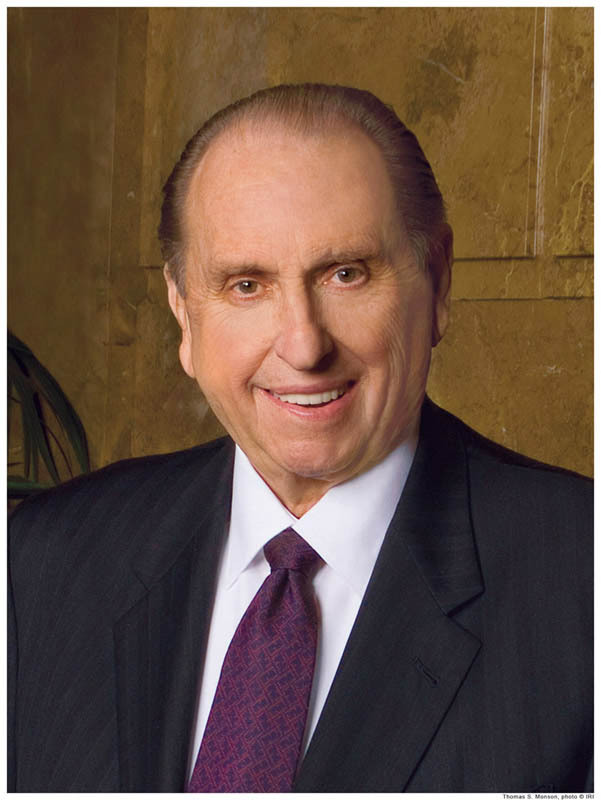 But let us never forget that we need a prophet, friends. And let us never forget what a gift it really is to say that. Kayla, I’m not very articulate. I know what I feel and can’t always express it in words. Your posts are my thoughts, my feelings, and I am grateful for your talent in being able to say it . . . just the way I would if I could! Thanks so much for visiting my blog and I wish you and your husband lots of luck in your new adventure. Someday I hope to visit both of those places–they look so beautiful. I will definitely visit your blog too! 🙂 Oh and by the way–I think your English is just great! you couldn’t have spoken for the women in the church any more perfectly. At 8 years old I heard and shook The hand of president Hebert J. grant. I knew then thru the spirt as I have felt many times since listening to our prophets they are truly Gods representative on earth. Thank you also for speaking up for all of us and saying how much we are grateful in the church and out for our gender role as women of faith and so proud of our place in the world and in the church. I am a 3rd generation member and 86 years old and so humbled to belong to the church of Jesus Church of Latter Day Saints. Moving away from prophets has not worked out well for Christianity. Every sect has it’s own doctrine and much of it seems to provide a feel good experience with little substance. 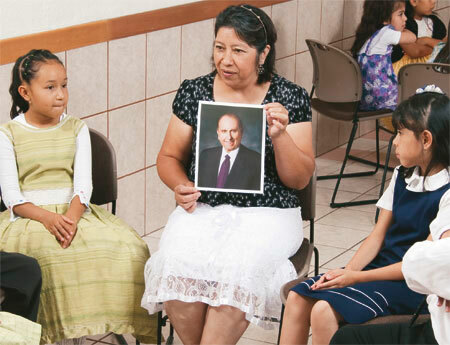 I appreciate those outside the church who testify of the Savior by the goodness in the lives they lead. I just do not understand how there can be so many voices–without a prophet which do you follow? I feel that we live in the best time in the history of the human species. No other time has humanity looked after each other more than we do now. I wouldn’t say that we live in a world that calls evil good and good evil at all. Steven Pinker in his book “Angels of Our Better Nature” argues that violence and death caused by a fellow human being has gone down on a millennial, century, and decade scale. With the thanks to modern medicine and science, child mortality has gone down while life expectancy has gone up. Literacy rates have gone up around the world as access to information is becoming easier and easier. These are the miracles that President Hinckley bore testimony about which were brought on by the brave women and men who dedicated (and in some instances GAVE their lives) to their research. Today, homosexuals and witches aren’t burned at the stake. We as society don’t practice eugenics to slowly weed out deleterious (or what we think are deleterious) alleles. We enslave less people around the world giving more races, religions, and people the freedom to live a happy and fulfilling life. On a whole, the world is a much better place than it was 10 years ago, 100 years ago and even 1000 years ago. Finally, the world is better today because of education and information. We learn about societies and cultures in school and subsequently have empathy for our brothers and sisters around the world. In the US, women can vote, slavery is abolished, and people are taught to think critically about matters of science, technology, religion, folklore, mythology, and creed. While I enjoyed your post on prophets, it pains me to think that the prophets and apostles hesitated, dragged their feet – and in some instances taught strictly against – the social changes that brought about the equal rights for women and the civil rights for blacks. Even today, our gay brothers and sisters are hurt by the teachings of the prophets and apostles over the pulpit. They are told that they are broken and that they chose to be sexual deviants. They end up making deals with God to take away their “trial”. 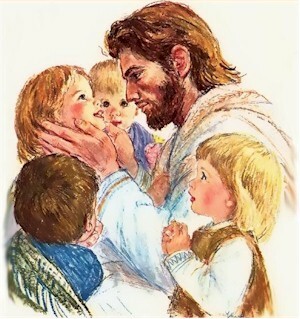 For example, a young man who – through all his years post puberty- never found interest in girls promises the Lord that if he serves a mission and keeps ALL the mission rules and commandments begs the Lord to make him not gay. He serves, he honors the rules, he becomes AP but is still attracted to men. As years go by, the prayers and deals with God go unanswered and soon he’s contemplating taking his own life because: a) God really doesn’t answer prayers and the atonement can’t fix him or b) God does answer prayers, but just not his. Either option is devastating and it gets harder and harder to live each day. No mention of race, or sexual orientation, or religion, or gender, or hating the sin. Just acceptance. I don’t know him personally, but I assume that Jesus would want the same thing today in the church – without judgement, shame, or caveat.